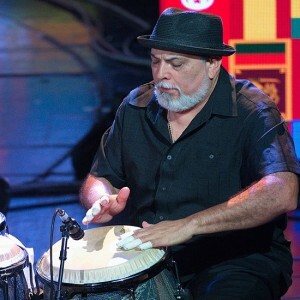 The tumbao refers to the rhythms accented by the conga drum player in mainstream salsa music. Specifically, the conga is struck with 2 quick beats and then a 3rd “slap”, usually on the outer edge or rim of the drum, in the pattern of quick quick slow. Sometimes this is audible in both 4 beat measures, and sometimes only in the first measure. The 2 quick beats are on 8 and 8 1/2, and on 4 and 4 1/2. These 2 quick beats serve as a lead-in to the 1st and 5th beats of the measure, the 2 heavy downbeats that we step on when dancing ON 2. In fact, when the 2 quick beats of the tumbao are very clear, they have the effect of “rushing us” into the 1 and 5 steps, making us hit them more emphatically and, sometimes, slightly early, which gives this style of dancing a snap and quickness in the look and feel. Sometimes the “slap”, or the “slow” hit of the tumbao is not audible. But when it can be heard, it is often the heavier and more emphatic sound coming from the conga drum. That sound comes on the 2nd beat of the measure. This means that if the tumbao sound can be heard during both 4 beat measures making up the 8 beats we dance to, then the strongest points of emphasis are on the 2nd and 6th beats, which is where we “break”, or change our body movement direction, when we dance ON 2. We Start On The Major Downbeat, We Break On The Clave And The Tumbao When Eddie Torres says that this On 2 timing and style of mambo dancing “logically fits the rhythm of salsa music”, he is referring to the fact that the strongest beats in the rhythm, the 1st and 5th beats, are where we begin our moves: we begin our basic step, our cross-body-lead, our turn patterns, our shines. In other words, the beats with the greatest rhythmic thrust (1 and 5) are what power the “On 2″ dancer’s moves. The greatest “push” or “action” in the music’s rhythm (the 1 and 5 downbeats) empower the greatest “action” in the dancer’s body (the initiation of a move). In addition, as noted above, we do our 2 strong body motions, the 2 and 6 breaks (change of body direction), on the major rhythmic beats of the clave, and the strongest sounds of the conga drum, the 2 and 6. So in all three ways (the strongest downbeats, the clave and the tumbao), this particular mambo dance style and timing expresses in its strongest body movements what the structure of salsa music expresses in its strongest rhythms. We start on 1, we break on 2: This distinguishes standard New York On 2 timing from those which break on 1, 3, etc., and those which don’t begin their moves on the 1st beat, such as timings where the dancers step on 2, 3, 4, and 6, 7, 8, for example Razz M’ Tazz and some Palladium, ballroom and international styles. Cuban Pete’s Personal Opinion – Quoting Fernando Lamadrid, “Cuban Pete, one of the greatest dancers of the Palladium era once explained it like this: “Dancing “On 1″ is dancing “TO” the music. Dancing “On 2″ is dancing “IN” the music. And at a panel discussion at the World Salsa Congress, he said “….Dancing “On 1″ is like dancing to the melody of the music, while dancing “On 2″ is like dancing in the rhythm of the music.” It might actually be more precise to say “…….dancing “On 2″ is like dancing in the rhythm of the clave’s tension-resolving and dominant 2 beat”. While these statements are only an opinion, they are not uncommon. They do reflect many On 2 dancers’ belief and feeling, especially those who danced on another timing previously, that this particular method connects them more to the rhythmic percussive elements in the salsa music. And, by the way, most of us also love the melody and the words in the songs, not just the rhythm. The major point here is that the New York On 2 timing connects very well to the rhythmic structure of classic salsa music. Please note, however, as mentioned in our Welcome & Introduction to this web site, that nothing here is meant to suggest that different ways of dancing to salsa music are any less legitimate or less enjoyable. No offense is meant, and none should be taken. There is no right or wrong way to dance. One can dance in many ways, and in connection with many different aspects of the music: rhythm, melody, mood, meaning of the words, tempo, harmony, intensity, etc. What matters most is what each dancer prefers…..and that they don’t smash into their neighbors on the dance floor.